1-Deoxynojirimycin, also called duvoglustat or moranolin, is an alpha-glucosidase inhibitor, most commonly found in mulberry leaves. Although it can be obtained in small quantities by brewing an herbal tea from mulberry leaves, interest in commercial production has led to research on developing mulberry tea higher in DNJ, and on alternate routes of production, such as via Bacillus species. 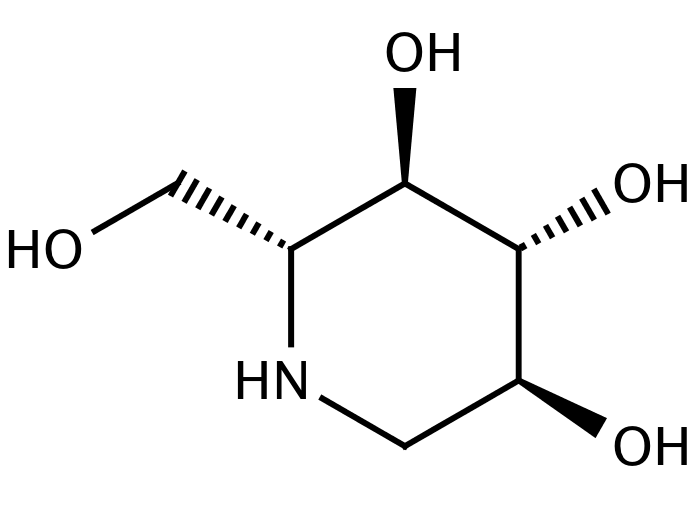 Send us your enquiry for 1-Deoxynojirimycin. We offer custom pack sizes at special prices. We aim to respond to your enquiry within 24 hours. We value your input so if you have suggestions regarding new applications for 1-Deoxynojirimycin email us and we will include your contribution on the website.